Bloodborne: The Death of Sleep #1 Review – AiPT! A new series based on the hit video game. 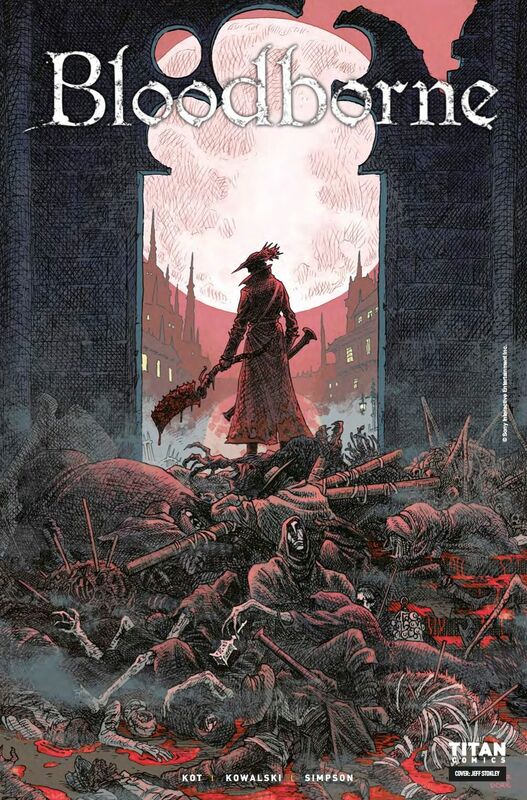 Bloodborne: The Death of Sleep #1 attempts to take the Victorian-meets-cosmic horror of 2015’s Bloodborne and tell a story in the same world in comic form. The rich worlds game developer Fromsoft creates are ripe for adaptation, but does this issue succeed in doing so? The series has a mixed start, with some elements blending less seamlessly than others. Writer Aleš Kot does a good job of including direct references and quotes from the game into the plot and dialogue. However, there were times where the direct quotes and Kot’s own script didn’t blend well and made the writing feel clunky. The explicit inclusion of one gameplay mechanic any Soulsborne fans will recognize felt particularly out of place in a comic book and may not translate to readers who haven’t played the games. I’m also hoping future issues will develop the unnamed protagonist a bit more. His amnesia and inability to grasp his circumstances feel like characteristics serving the mythos of Bloodborne more than development of the character himself. What I liked most about this issue was artist Piotr Kowalski’s highly detailed pencil and ink work. One of my favorite things about Bloodborne is the creature design and Kowalski renders the monstrous denizens of Yharnam in ghoulish detail. His artwork makes them instantly recognizable to fans of the game like me and properly terrifying to newcomers. Yharnam’s Gothic architecture looks imposing and on the most detailed pages, every brick is neatly drawn and small details in the hunter’s armor and weapons give the pages extra flair. Though the level of detail drops in some panels, seeing a particularly grisly boss from the game recreated in all its sickening glory put a grin on my face and made me excited to see what other bosses appear in the series. Less exciting were Brad Simpson’s colors and Aditya Bidikar’s lettering. I appreciate that the colors were bright enough to make the line work stand out, but the overall brightness of the issue detracted from the grim, mysterious tone the script was trying to establish. Details like vibrant yellow flames or sickly pale skin show Simpson was working with solid palette choices, but more shadows and gradients would’ve helped make the colors feel less flat and bright. The lettering was even less faithful to the tone. The action effects felt cartoony throughout and the fonts chosen for both the narration and the recreation of the aforementioned gameplay mechanic felt like imitations reaching for the same feeling the game had. Even divorced from the game completely, the letters simply don’t feel like they belong in a horror series as dark as this issue tries to be. Bloodborne: The Death of Sleep #1 is ultimately a shaky start to the series. As a huge fan of the video game, I hope later issues manage a better grasp of the tone this issue tries to achieve. Until all the contradicting elements mesh better together, I worry the series will end up feeling more like a product in a franchise than a cosmic horror story worth celebrating. Excellent artwork, an almost there script, and simplistic colors and lettering make the start of this series a mixed bag. The pencils and inks brings the world of Yharnam to life in vivid, gruesome detail. Fans of the game will recognize direct quotes and references. At times, those same quotes and references feel forced and may alienate people who haven't played the game. The colors and inks feel completely at odds with the script's intended tone. The protagonist needs a lot more fleshing out to make the reader care about him.